This was my second time using my new Optimum Induction Pressure-Cook Pro, and I wanted to see if it would allow me to skip the “soak for 8 hours before use” step that usually comes with sticky rice recipes. I cooked the sticky rice by adding a bit more water than you would for white rice, then set the pressure cooker on the “porridge” setting and it worked beautifully. I first encountered sticky rice cooked with durian and palm sugar at an expo in Kuala Lumpur on the culinary offerings of Pahang. I forget what it’s called, and a google search of pulut (sticky rice) + durian yields nothing that looks like what I ate, so you’ll have to take my word for it that this dish does in fact exist. Absent palm sugar, just use white sugar to yield an equally delicious (I’m guessing; haven’t tried it) result. Combine all ingredients in a non-stick pan. Mix well, then bring to a low simmer. Cook until mixture is semi-dry and a sticky consistency. Combine onion, garlic, lemongrass and curry powder in a non-stick pan. Fry on low heat to remove some of the moisture from the onion. Add oil and fry until spice paste is lightly browned. Add all other ingredients, mix well and cook a further 5 minutes. Adjust seasoning, remove from heat and allow to cool. To assemble, place 2 Tbsps sticky rice on seaweed sheet. Flatten into a rectangular shape, then place 2 tsps serunding along the length of the sticky rice and roll up. Cut into sushi-sized pieces before serving. Alternatively, roll sticky rice into balls and coat with serunding before serving. 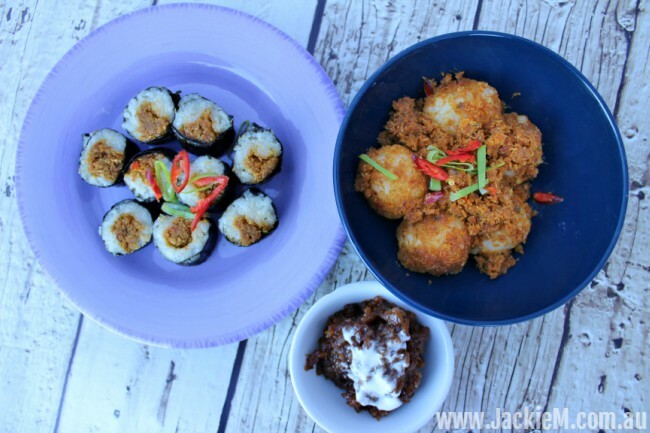 *** I used an Optimum Induction Pressure-Cook Pro for the Sticky Rice recipes in this post. More details on this appliance can be found at Prestige Home Appliances.